I explained a bit about chronic training load here. This post is going to try to give you a quick look at the Performance Management Chart (PMC) and some ways to use it. Below is a PMC. You’ll notice three things right off the bat. There is a blue line which represents Chronic Training Load (CTL), a pink line represents Acute Training Load (ATL) and the yellow bars or line represent Training Stress Balance (TSB). The pink line or ATL represents your current workload, think of this as the what did I do day in day out and how much acute stress did it place on me. If you do some really long and/or hard workouts where you rack up a lot of training stress this line will go up in a steep manner. 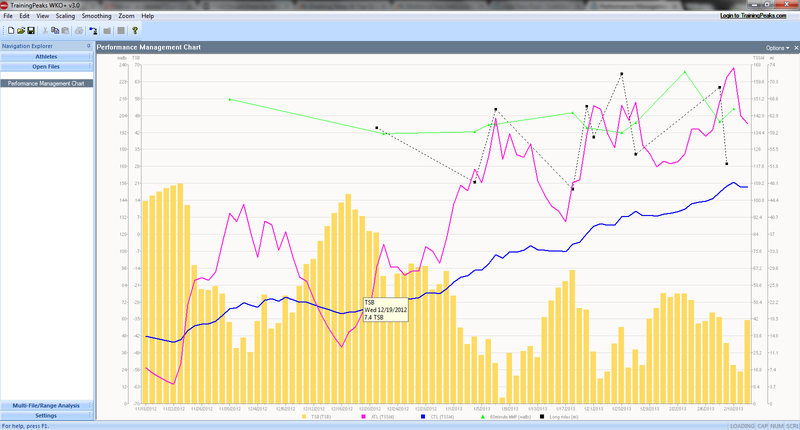 The yellow is indicative of your fatigue level and it moves more or less in opposition to the pink line. If you don’t workout for a few days the yellow goes up meaning you are fresher or more rested than you were while the pink line goes down representing your lack of daily stress. 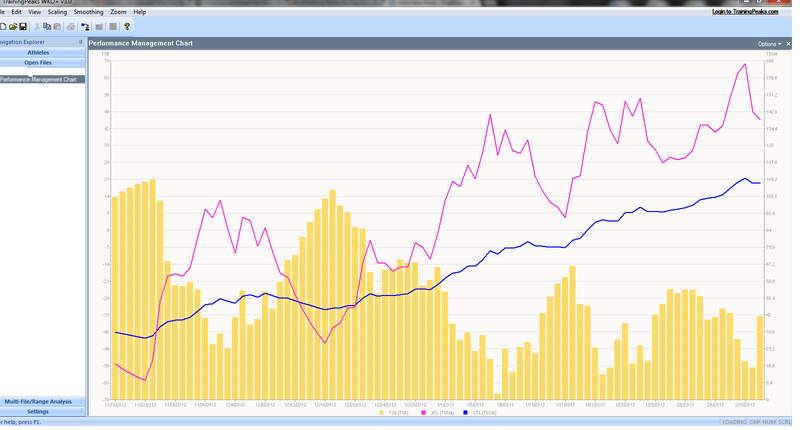 The blue line will move up and down slower and reflects your cumulative fitness or loss of if it’s moving down. Consider CTL as money in the bank, while the pink line is money you are depositing. One of the things you can do is use the ATL and TSB then correlate that to how you are feeling. If the ATL line spikes and you are doing a multi-day hard block of training, naturally you will feel more tired as it progresses. If you are at -52 TSB you might not be feeling very chipper, at -89 TSB you might find yourself unpleasant to be around. At -10 TSB you may feel fine and at 12 TSB you might feel like you could take on the world. Taking what you are doing, how you are feeling, thinking about what’s happened in the past and looking at the trend lines can often tell you what might happen if you continue down the path you are on. You can use the CTL to make sure your training is on track. Do you have some races coming up in 2-4 months? You can track the work you are doing on the blue line. The higher it goes the more you can do and the more likely you are to have a good level of fitness going into your race. If your blue line is dropping to the right and you are not tapering you should re-evaluate your training strategy or lack of. Of course for those Key Races, a drop in your CTL coupled with an increase in your TSB and a decrease in your ATL is a good thing. The key words are key races, not every race you do. You might think of your ATL and TSB as short term snapshots and your CTL as the big picture. Or you can consider ATL/TSB as the path that you’ve ridden on your journey(CTL). You can do different things in your training and see how they impact those lines. There are four training inputs you can manipulate: time, duration, intensity and volume. Each of these will impact the ATL, CTL and TSB differently. You can ride 3 hours and achieve a certain amount of training stress. Or you can ride 3 hours at a harder effort and achieve even more or you could go on a casual ride and accumulate a smaller amount of stress. Which is better? It depends. The higher your power output relative to your threshold the more stress you rack up per minute. Riding at 65% of your FTP is much easier and can be done for much longer than riding at 104% of FTP. Within the PMC there are several variables you can track. If you are cyclist gearing up for TT’s you can track your peak power outputs over the specific duration you are going to be racing. If you are a sprinter you can track you maximal power outputs, or if you are a lead out type of rider you can track your power over 2-10 minutes or the duration you need to deliver your sprinter to the line. You can use this information to see if you are trending in the right or wrong direction. Are you producing a lot of peak 4 min power outputs months and months away from your targeted event(s)? The PMC provides a quick reference guide to tracking things like this so you can see if you are overcooking or undercooking or making a feast. If you are a long course triathlete tracking your power outputs over longer duration’s will serve as a guide to help you plan your power strategy. If you have a lot of ironman duration rides between 190 and 205 watts, deciding that 230 watts is your goal power output for your IM is a recipe for disaster. Using the PMC helps take the guesswork out of what to do race day. You can set it up so you know exactly what power outputs you’ve done over the duration’s you are going to be racing. This allows you to be smart and give yourself the best chance for success for your races. You can use the PMC to help you plan out what to do. If you did race X, Y and Z at certain CTL’s and your performance left you underwhelmed, you can use the PMC to determine what sort of workload might be appropriate to leave you overjoyed at the finish. If your CTL was 65 what happens if you do more training and get it to 101? What happens if you do more intervals or more easy rides to increase your workload? Using the various metrics in your PMC you can track some of these variables. I’d advise you to play around with your PMC adding different data points until you have the information on it that makes the most sense to you for your racing. Use it to help you plot out what you have done, what you can do, review it to figure out what gave you the most fitness bang your training buck. Isn’t that what I pay you for! ?